The Dim Sum Diaries | Brickhouse | "One cannot think well, love well, sleep well, if one has not dined well." 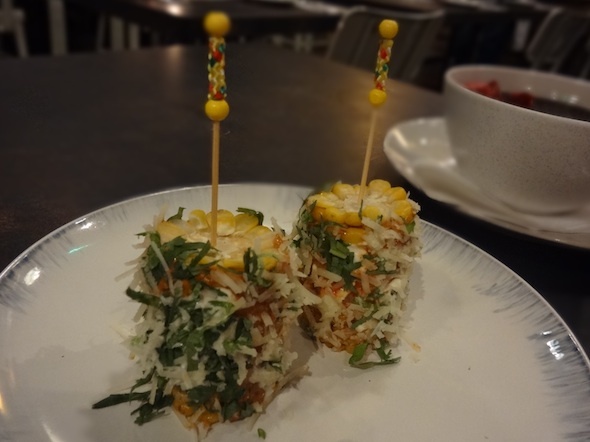 Mexican is the flavour of the moment across Hong Kong. After complaints that there were no good tacos in the city, taco shops popped up everywhere, adding to the throng of pretty average Tex-Mex restaurants. When word got out that new kid on the block Brickhouse would be opening as yet another Mexican resto, I was excited, but I can’t say I expected grand things. Boy, was I wrong. As we know already from many of Hong Kong’s hidden gems, some of the best places are tucked away behind the scenes. 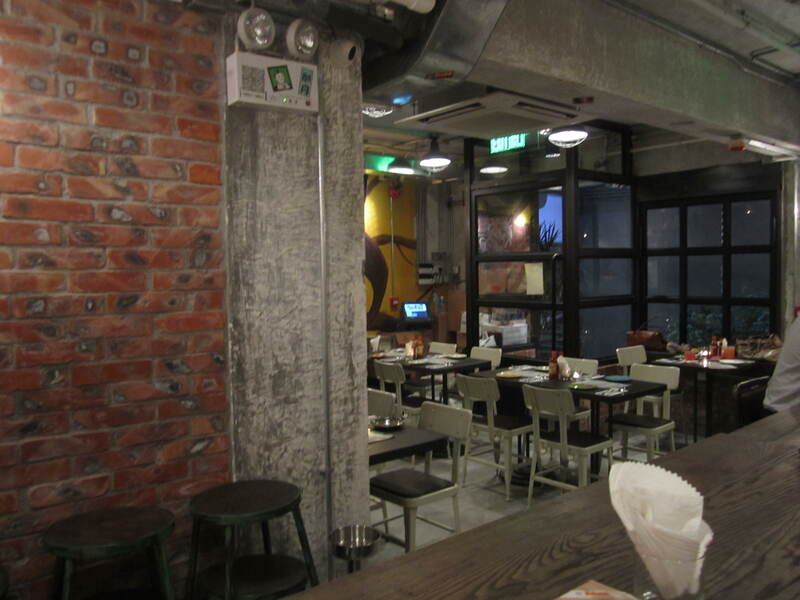 Such is the case with Brickhouse; you’ll only find it if you’re looking for it, as it’s hidden away down a random-looking side alley as you approach Lan Kwai Fong, There is no signage on or around the restaurant as the idea is to keep it cosy, exclusive and hidden. I like this idea, except the hidden part in practice doesn’t seem to be working: it’s been open for three weeks and it’s heaving every single night! Brickhouse has a no reservations policy. Imagine the thrill and excitement that Yardbird has, a year after opening, double it, and that is what I’m expecting Brickhouse will be like, with queues all the way down the alleyway to get a table. Luckily it’s open until 2am on a weeknight, and 5am on a weekend, so I’m very excited about the idea of a midnight (taco) feast. I love the vibe at Brickhouse; as soon as I walked in, I was wowed by the eclectic décor consisting of graffiti-esque paintings by local artists, stickers dotted willy nilly all over the place, a very rustic floor, and obviously red brick wall panels. 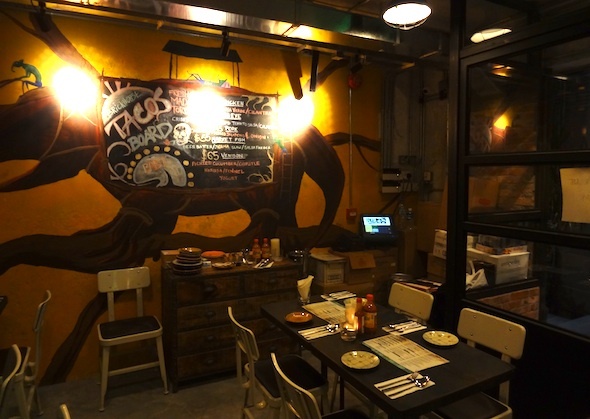 The quirky design makes the place look unfinished, yet in a really hip and funky kind of way. Music is blasted out at a tolerable volume making you instantly want to sing along and dance, and it looks as though even the staff are having fun; with so many miserable, moody waiters across the city, seeing staff who actually love what they are doing is really refreshing. The menu is rather eclectic too. The choice is vast, yet portions are small, meaning you are able to choose a handful of dishes to share, which is my absolute favourite way of eating. While you’re thinking of what to order, definitely try one of Brickhouse’s exciting cocktails, my favourite being the Diabla, consisting of jalapeño vodka, raspberries, pomegranate and lemon: fruity and sharp with a subtle chilli kick. 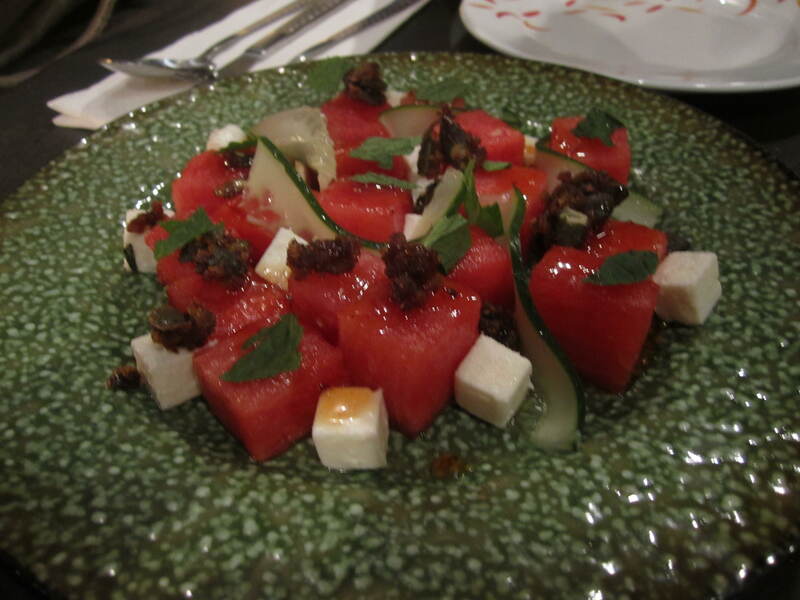 Our feast began with a Watermelon salad. As I’ve mentioned plenty of times, I am not a salad fiend. However, this salad, made with cubes of the freshest watermelon, strips of cucumber, goat’s feta, clusters of candied pumpkin seeds and chilli syrup was absolutely incredible, with the flavours and textures working perfectly together. The Mexican street corn is a must. The sweet, juicy corn on the cob is first smothered in chilli mayo with lime, then sprinkled generously with grated cheese and coriander to give it a little something special without losing the taste of the corn itself. We both polished off our share without a word. Beetroot is still one of those things that I’ll eat if it’s put in front of me as I know it’s good for me, but if there were other vegetables, I’d probably choose those. 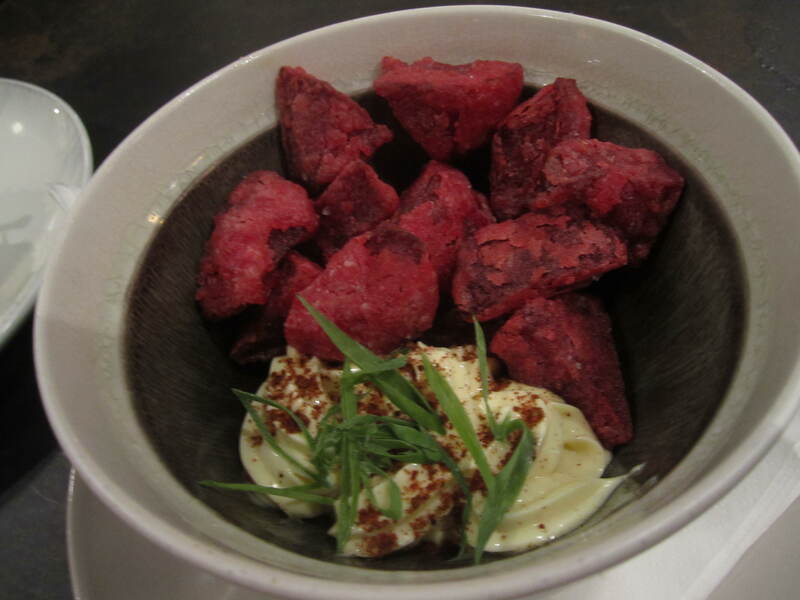 The homemade beet fries, however, are something special. First roasted, then deep fried in a very light tempura batter, and finally dipped in the accompanying sweet chilli mayo, these were delicious and more-ish, yet almost 100% guilt-free. There are two options of Tostadas, of which, of course, we tried both. While the braised octopus had a great flavour, it was a little on the chewy side. The yellowfin tuna tostada, however, with chipotle mayo and habanero mustard, was delicious melt-in-the-mouth goodness on top, with perfect crunchtastic toasted tortilla below. A note about the tortillas: these corn tortillas are made fresh in-house every day, something somewhat novel amongst Hong Kong’s Mexican eateries. The taco choices are listed on a blackboard and change regularly. Our choices, of which again we tried all five, were chicken, pulled pork, market fish, rib eye with crispy manchego, and venison. All had their own interesting flavours, but the absolute shining star of the lot was the rib eye with crispy manchego, grilled tomato salsa and coriander. The meat was beautifully tender, the dressings utterly divine. Although it sounds delicious, our suggestion is that you skip the venison and get two of the rib eyes instead. 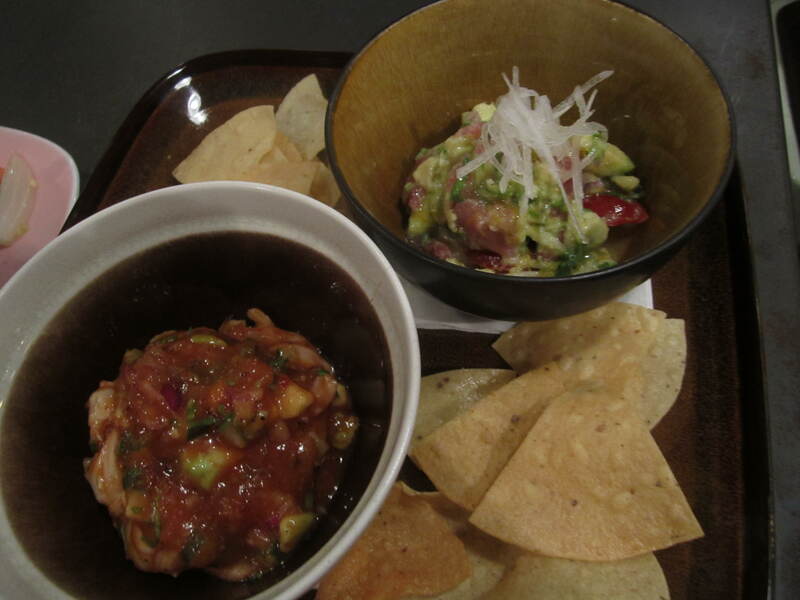 Of the three Ceviche options, we tried the Back to Life (a blend of shrimp, grilled tomato, smoked chilli, horseradish and citrus dressing) and the Peruvian (yellowtail tuna, apple, daikon relish, orange, avocado and yuzu-lime dressing). The former was a little too strongly-flavoured for my palate, but I adored the delicate flavours and super tender textures of the Peruvian ceviche. 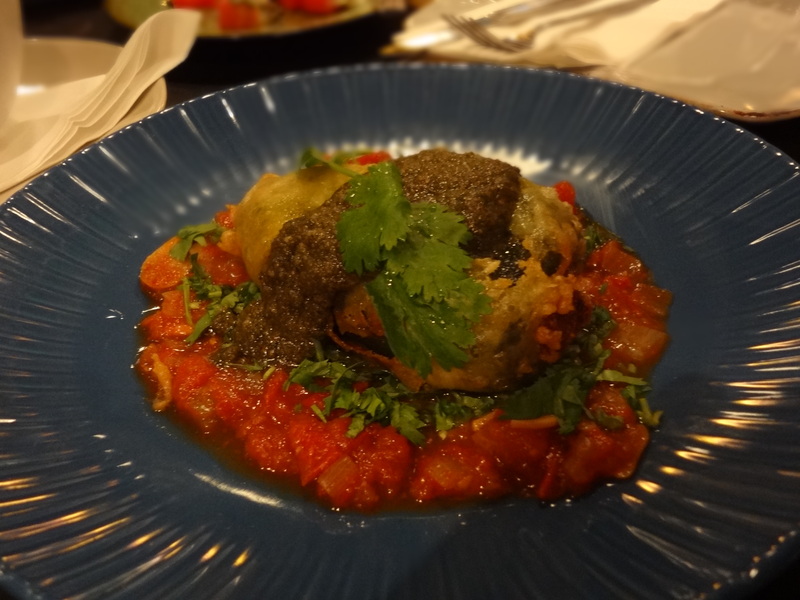 From the main courses, we tried the Chilli relleno, a poblano pepper stuffed with quinoa, butternut squash and manchego cheese, served in a rich tomato broth. If I were a vegetarian, I would be more than satisfied with this wholesome, comforting dish. 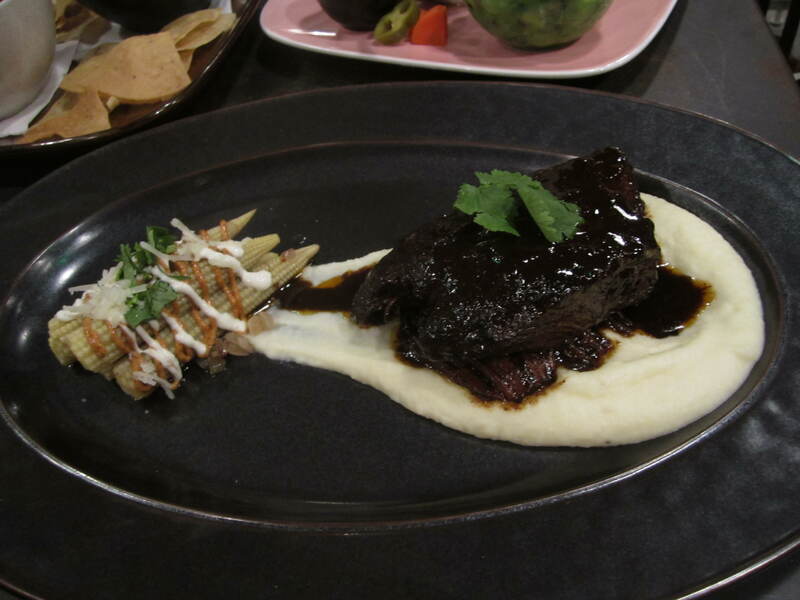 The beef shortrib was beautifully tender and sweet, cooked in a brown sugar reduction, served with creamy mashed potato and baby corn done in the same way as the street corn. 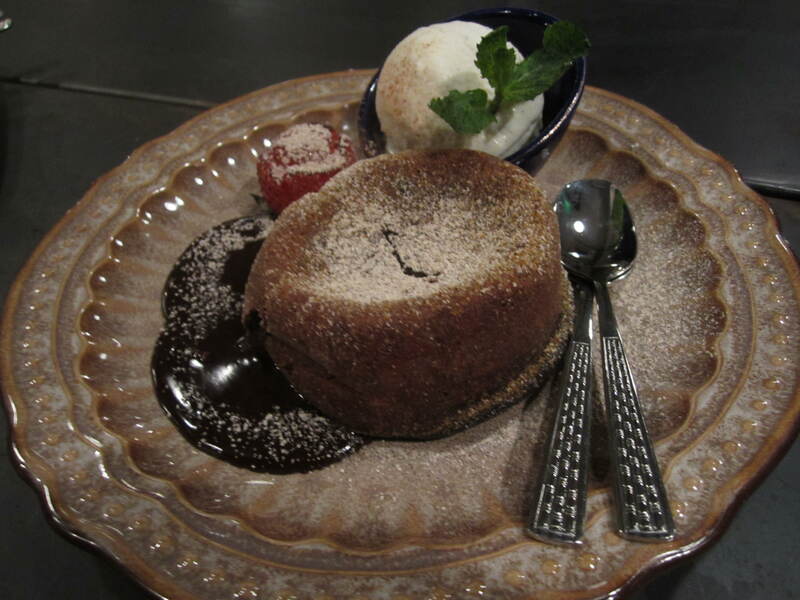 The chilli chocolate cake, although I couldn’t detect even the tiniest hint of chilli, was most definitely the best chocolate fondant I have had in Hong Kong and simply oozed molten chocolate goodness at the touch of a fork. After only one trip to Brickhouse, I think it has already become one of my favourite places in this restaurant-filled city. Everything about it from the super upbeat vibe, to the friendly waiters, dangerously tasty cocktails, delicious food (at relatively reasonable prices – the average food bill will come to $300 per person, without drinks) and the fact that no service charge is added to the bill leaves no doubt in my mind that it will be a roaring success…if it isn’t already. 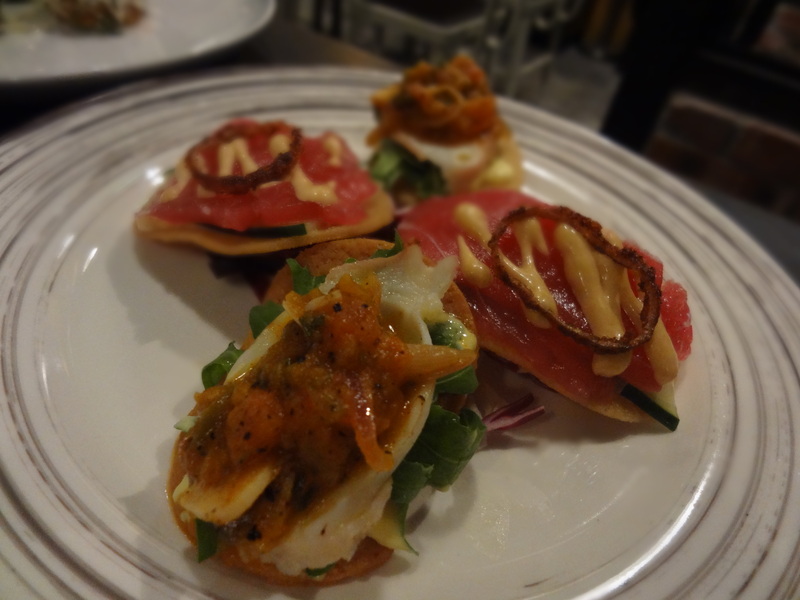 Why not have a read of my mini-review of Brickhouse on Localiiz too? You might find some other exciting restaurants on there! Perhaps the worse service I have ever had. The food and drinks were good, but not good enough to compensate for their dim-witted service staff. Cute and friendly they may be, but it was a case of the “lights were on but no one was at home”. This restaurant should be re-named as Thick Bricks because the service staff are as thick as two bricks. Not only were they slow and unattentive, they got both food and drink orders wrong at every opportunity. It was complete incompetence at the highest level. Thanks for the comment. I’m sorry that you feel so strongly against Brickhouse. I had a great experience there as you can tell from my review, and in fact everyone else I know who has been has also enjoyed it, so perhaps you just caught the waiters on an off day. It’s aiming for a very casual, laid back vibe where diners can have a relaxed meal over a couple of hours whilst enjoying some drinks, and so far I think it has achieved this. Perhaps if you gave it another try you might change your mind. After all, everyone deserves a second chance! Totally agreed! There were plenty of wait staff but no one seemed to care. We walked in to the restaurant at 10.50pm. There was no one to seat us so we found ourselves a seat. After sitting down for five minutes still no one came to see us but two staff members came only to check out the paintings behind me. They were almost right next to us but we seemed invisible to them, even though I tried to look at them to see if they will be “interested” in noticing us. Finally I had to do the Chinese way – raise my hand to get their attention. A lady came, I asked her if we could just order from the table, she replied yes. I said I would order in a couple of minutes. Then when I was ready, I tried I order the beef ribs. She told me we can no longer order this as it was past 11pm, the kitchen already closed. We could only order from a smaller selection. I looked at the watch, it was 11:02pm at the most! And if she would have informed me about the “deadline”, I would have hurried up and not waste my time choosing dishes that were unavailable. No one ever told us anything about the change of menu from the moment we walked in. And she had the perfect opportunity to tell me when I asked about order at the table, she didn’t say a thing. We asked for the manager, he was very apologetic and understanding. I ordered a diet come, but they gave me a normal coke. The guy that brought my drink looks as if he hated me as he poured my drink. I thanked him, no reply. The lady that dropped our food gave us two side plates for sharing, well, one plate and one coffee saucer to be exact. I’m not sure if cutleries are usually given to guests but I wanted some. I looked around, 3 staff members were chatting in a circle, so I thought there’s no point to raise my hand again and look stupid. Instead, I went to them and asked if I could take some cutleries, the same lady that served us just said “sure” and pointed out where the cutleries side station was, indicating that I can just help myself. She obviously didn’t care and had zero interest in service recovery. The food is not bad, and the cocktail is good too, probably one of the best pisco sour I’ve had in a long time in HK. But the service made my visit very disappointing. 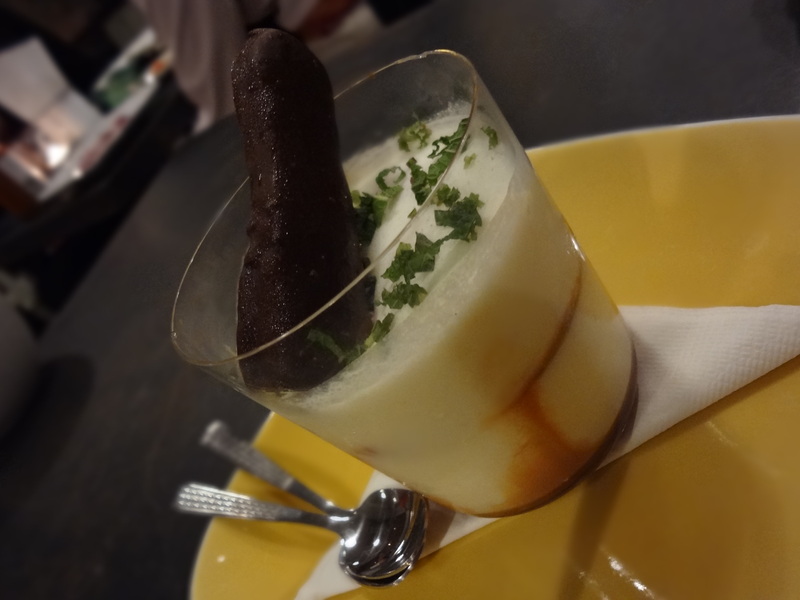 I expected more from a Maximal Concept restaurant.. Your review was spot on. I’m going tonight for the third time. Definitely get there before 6:00 if you can. I put my name on the list at 7:00 on a Wednesday and had a few too many at Hong Kong Brewhouse before a table opened. Thanks for your comment, Janet. I’m glad to hear you liked my review and am so happy that you’re also a fan of Brickhouse! I’m still yet to go for a second visit as there are too many places to try at the moment, but I can’t wait until this restaurant opening frenzy is over so that I can go again! I’ve subscribed now – so I highly encourage you to find other Hong Kong jewels :). I’ll do my best at finding lots of jewels for you. There are lots of things on the list for the next few weeks – watch this space! Enjoyed the drinks and the “vibe” was fun. Two minor complaints, the meat in the tacos seemed cold? (on every dish we tried!). I also think they use mayonnaise too liberally. I know some Asian foods use mayonnaise (i.e. sashimi rolls), but Mexican food? Perhaps if it was more tangy/spicy? Chipotle based? Maybe it is just me, but I think traditional sour cream would be much better. My quest for Southern California-style Mexican food in Hong Kong continues. Hello! I just moved to Hong Kong from the US and have been seriously craving some good Mexican food. I tried a couple of places – not yet Brickhouse, though it is on my list – and wasn’t really impressed. Do you have any other places you could suggest? Or are there just not many good Mexican food places in HK? Thank you! Hi Anu, thanks for your comment. Unfortunately there aren’t that many good Mexican places. Brickhouse is fun and tasty, but service can be hit or miss. Little Burro is good for San Francisco style burritos and tacos – have you tried that yet? 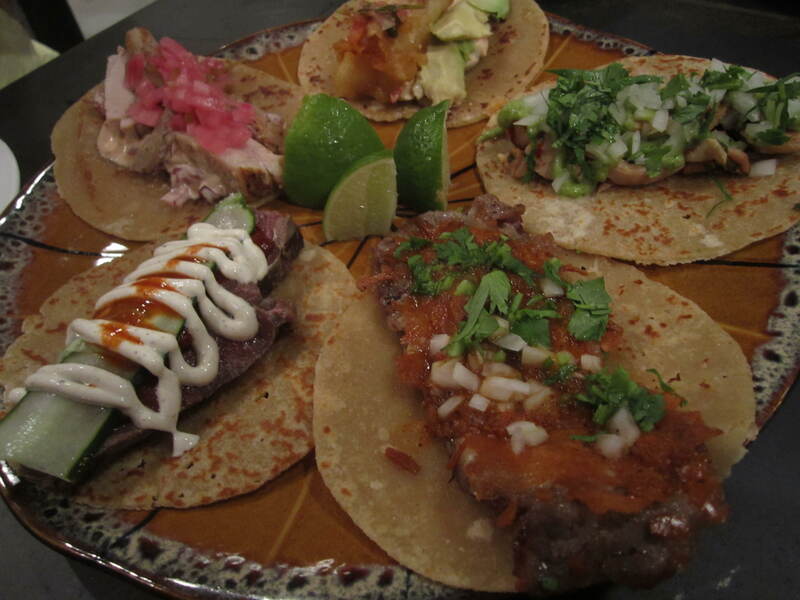 If you find any exceptional Mexican places then do let me know as I love Mexican food too!